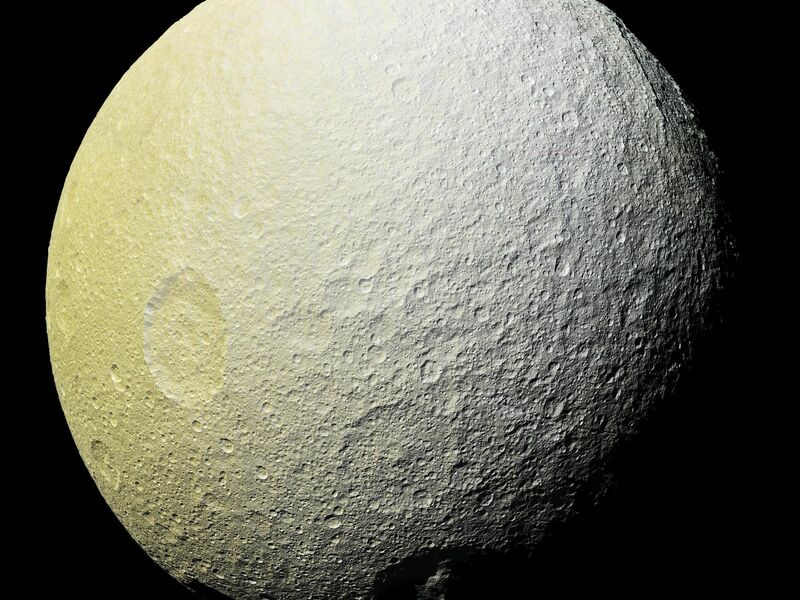 Images taken using clear, green, infrared and ultraviolet spectral filters were combined to create the view, which highlights subtle color differences across Tethys' surface at wavelengths not visible to human eyes. The moon's surface is fairly uniform in natural color. 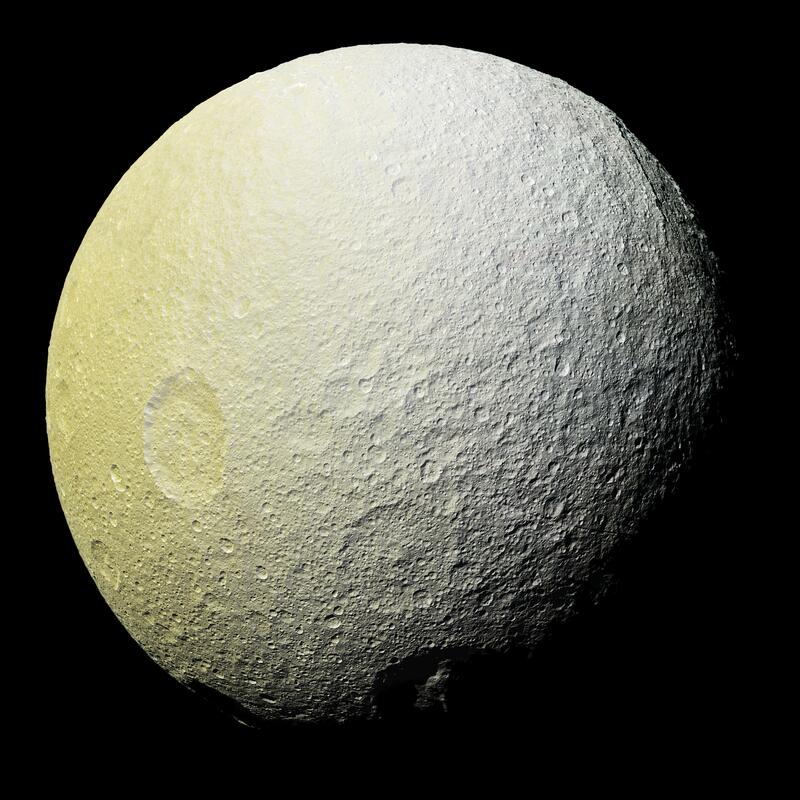 The color of the surface changes conspicuously across the disk, from yellowish hues to nearly white. These broad color changes are affected by a number of external processes. 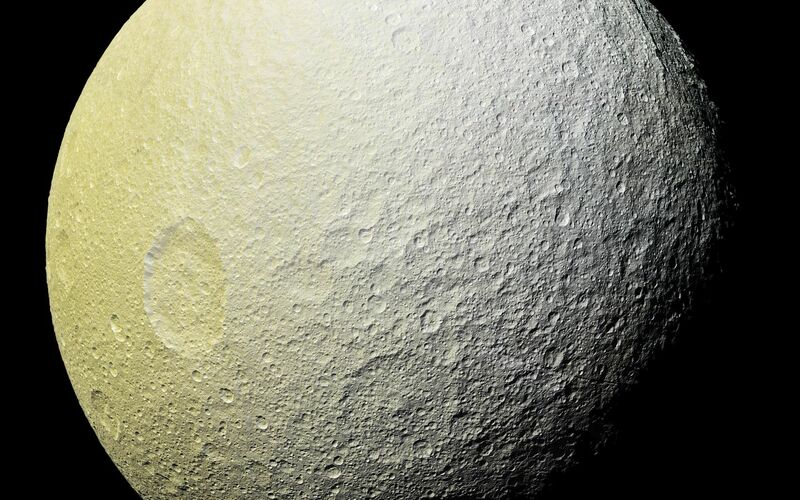 First, Saturn's diffuse E-ring preferentially bombards Tethys' leading hemisphere, toward the right side of this image, with ice bright ice grains. At the same time, charged particles from Saturn's radiation belt bombard the surface on the trailing side, causing color changes due to chemical alteration of the materials there. The albedo -- a measure of the surface's reflectivity -- drops by 10 to 15 percent from the moon's leading side to the trailing side. Similar global color patterns exist on other Saturnian moons. On a much smaller scale, enigmatic, arc-shaped, reddish streaks also are faintly visible across the heavily-cratered surface, particularly if one enhances color saturation in the image (see PIA19637 for a close-up view of these features). The origin of this localized color contrast is not yet understood. Mountains on the floor of the 280 mile- (450 kilometer-) wide Odysseus impact basin are visible at upper right, around the two o'clock position. This mosaic is an orthographic projection constructed from 52 Cassini images obtained on April 11, 2015 with the Cassini spacecraft narrow-angle camera. Resolution is about 1,000 feet (300 meters) per pixel. The images were obtained at a distance of approximately 33,000 miles (53,000 kilometers) from Tethys. This view is similar to PIA19638, but shows terrain slightly farther to the east and north.